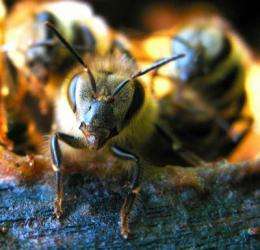 Dr Leonard Foster from CHIBI at the University of British Columbia, who led this research said, "Bee keepers have previously focused on selecting bees with traits such as enhanced honey production, gentleness and winter survival. We have found a set of proteins which could be used to select colonies on their ability to resist Varroa mite infestation and can be used to find individuals with increased hygienic behavior. 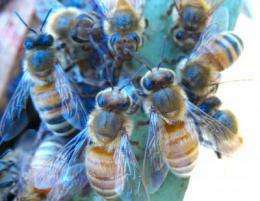 Given the increasing resistance of Varroa to available drugs this would provide a natural way of ensuring honey farming and potentially survival of the species." Hmm. Maybe they can identify some treatment which, applied to existing colonies, would make their members more sensitive, or more likely to react to the presence of these proteins (e.g. transglutaminase). Sort of, a macro-scale antibiotic. Interesting. I've attended a talk by Ron Hoskins of Swindon Bee fame, and noticed behaviour similar to his description of the Swindon Bee in one of my hives: infected larvae being removed by the bees. I stopped treating my hives with chemicals 12 years ago when the prescribed dose of a thymol based varroicide killed them. Since then my bees have come from feral swarms that entered my empty hives and they are keeping healthy and productive. Google "keep bees without chemicals".